Most people are afraid of social isolation. Therefore people constantly observe other people’s behavior in order to find out which opinions and behaviors are met with approval or rejection in the public sphere. People exert “isolation pressure” on other people, for instance, by frowning or turning away when somebody says or does something that is rejected by public opinion. People tend to hide their opinion away when they think that they would expose themselves to “isolation pressure” with their opinion. People who feel public support, in contrast, tend to express their opinion loud and clear. Loud opinion expressions on the one side and silence on the other side sets the spiral of silence into motion. The process is typically ignited by emotionally and morally laden issues. In case of consensus on an issue in a given society, it is unlikely that a spiral of silence will be set into motion. The spiral is usually elicited by controversial issues. The actual number of partisans of an opinion is not necessarily decisive for their weight in the spiral of silence. The opinion of a minority may actually be perceived as majority in the public sphere if their partisans act assertively enough and publicly defend their opinion with emphasis. Mass media may have a decisive influence on the formation of public opinion. If the media repeatedly (in a “cumulative” way) and concordantly (in a “consonant” way) support one side in a public controversy, this side will stand a significantly higher chance of finishing the spiral-of-silence process as winner. Fear of and threat with social isolation operate subconsciously: Most people do not consciously think about how their behavior is oriented by public opinion. Public opinion is limited in time and space. Wherever people live together in societies, public opinion will function as a mechanism of social control. However, what specifically public opinion approves or rejects will change with time and differ from place to place. Public opinion stabilizes and integrates society because conflicts will be resolved through spirals of silence in favor of one opinion. This is what is referred to as the integration function of public opinion. 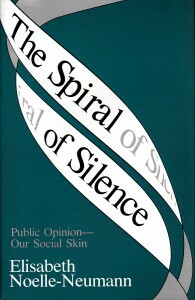 Elisabeth Noelle-Neumann first presented the spiral of silence theory in two scientific articles in 1974.5)Elisabeth Noelle-Neumann: Die Schweigespirale: Über die Entstehung der öffentlichen Meinung. In: Ernst Forsthoff & Reinhard Hörstel (Eds. ): ...continue In 1980, the first book on the spiral of silence was published in German,6)Elisabeth Noelle-Neumann: Die Schweigespirale. Öffentliche Meinung – unsere soziale Haut. Piper, Zürich/München 1980. followed by the first edition in English in 1984.7)Elisabeth Noelle-Neumann: The Spiral of Silence. Public Opinion – Our Social Skin. Chicago University Press, Chicago 1984. In total, the book has been translated into 11 languages. 1. ↑ Elisabeth Noelle-Neumann: Die Schweigespirale. Öffentliche Meinung – unsere soziale Haut. Piper, Zurich/Munich 1980. 2. ↑ Wolfgang Donsbach: Die Schweigespirale. In: Christina Holtz-Bacha & Arnulf Kutsch (Eds. ): Schlüsselwerke für die Kommunikationswissenschaft (pp. 336-339). Westdeutscher Verlag, Wiesbaden 2002. 4. 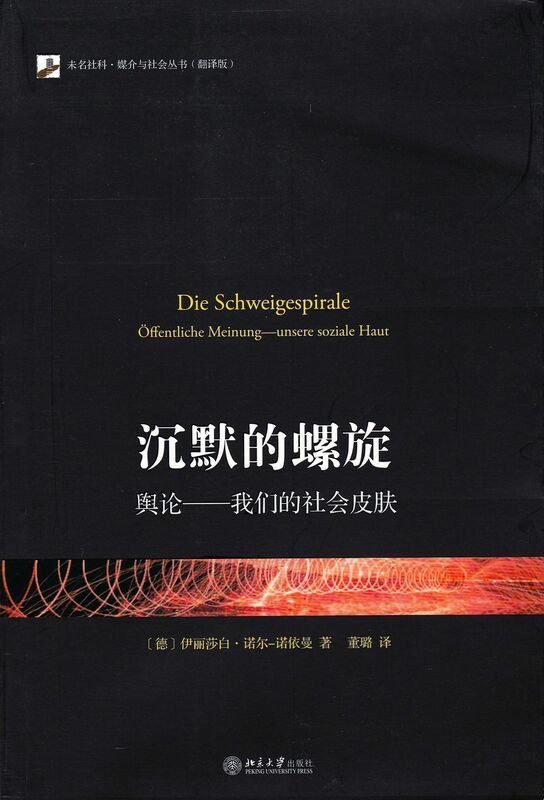 ↑ Elisabeth Noelle-Neumann & Thomas Petersen: The spiral of silence and the social nature of man. In: L.L. Kaid (Hrsg. ): Handbook of Political Communication (pp. 339–356). Lawrence Erlbaum, London 2004. 5. ↑ Elisabeth Noelle-Neumann: Die Schweigespirale: Über die Entstehung der öffentlichen Meinung. In: Ernst Forsthoff & Reinhard Hörstel (Eds. ): Standorte im Zeitstrom: Festschrift für Arnold Gehlen (pp. 299-330). 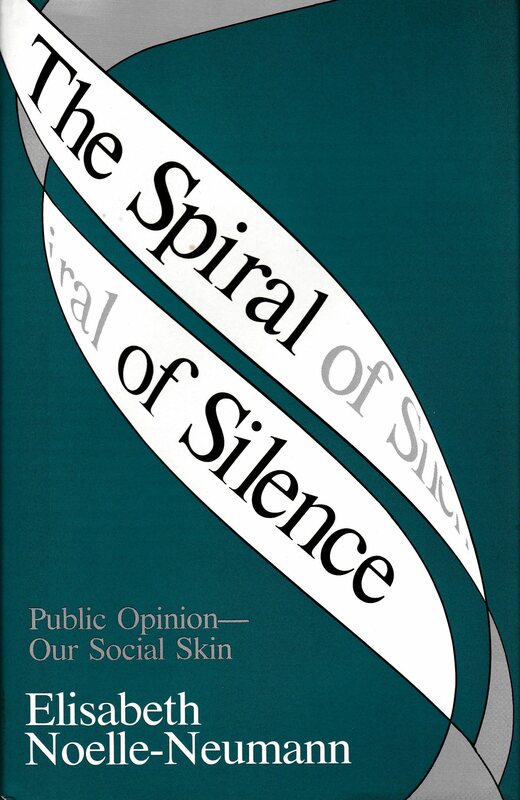 Athenäum, Frankfurt 1974; Elisabeth Noelle-Neumann: The spiral of silence: A theory of public opinion. The Journal of Communication, 1974, 24, pp. 43-51. 6. 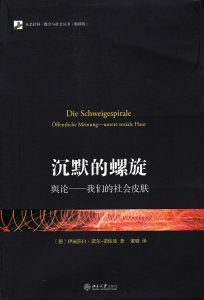 ↑ Elisabeth Noelle-Neumann: Die Schweigespirale. Öffentliche Meinung – unsere soziale Haut. Piper, Zürich/München 1980. 7. ↑ Elisabeth Noelle-Neumann: The Spiral of Silence. Public Opinion – Our Social Skin. Chicago University Press, Chicago 1984.